Astronomers have just made a new measurement of the Hubble Constant, the rate at which the universe is expanding, and it doesn't quite line up with a different estimate of the same number. That discrepancy could hint at "new physics" beyond the standard model of cosmology, according to the team, which includes physicists from the University of California, Davis, that made the observation. The Hubble Constant allows astronomers to measure the scale and age of the universe and measure the distance to the most remote objects we can see, said Chris Fassnacht, a physics professor at UC Davis and a member of the international H0LiCOW collaboration which carried out the work. Lead by Sherry Suyu at the Max Planck Institute for Astrophysics in Germany, the H0LICOW team used the NASA/ESA Hubble Space Telescope and other space- and Earth-based telescopes, including the Keck telescopes in Hawaii, to observe three galaxies and arrive at an independent measurement of the Hubble Constant. Eduard Rusu, a postdoctoral researcher at UC Davis, is first author on one of five papers describing the work, due to be published in the Monthly Notices of the Royal Astronomical Society. "The Hubble constant is crucial for modern astronomy as it can help to confirm or refute whether our picture of the Universe—composed of dark energy, dark matter and normal matter—is actually correct, or if we are missing something fundamental," Suyu said. Dark energy is a mysterious force which makes up about three-quarters of the universe and drives cosmic expansion. Dark matter makes up about a quarter of the universe and exerts a gravitational pull on visible, "normal" matter and light. 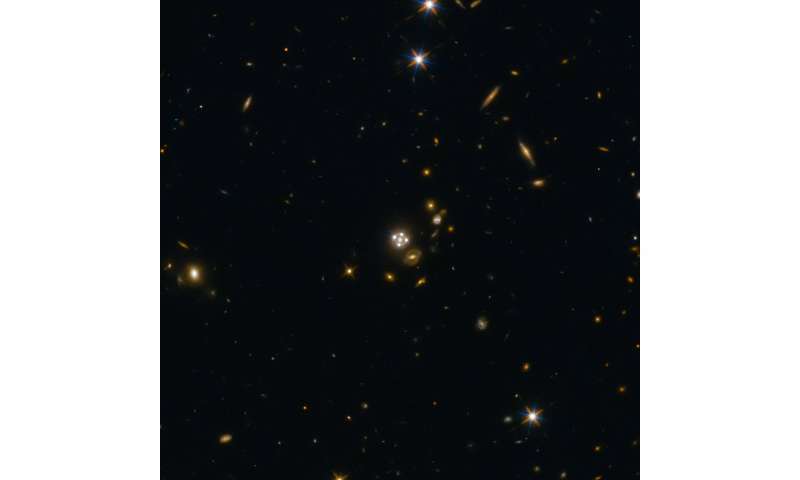 The H0LiCOW astronomers measured the Hubble Constant by exploiting massive galaxies that act as "gravitational lenses," bending light from a yet more distant object. They studied three such galaxies, each of which is bending light from an even more distant quasar, a cosmic object whose brightness fluctuates randomly. In each case the gravitational lens creates multiple images of the quasar. Because mass is not evenly distributed through these massive galaxies, some areas bend or slow light more than others. So light from the quasar will arrive at slightly different times depending on the route it takes through the lens, just as drivers who set off from one city to another at the same time, but travel by different routes, will arrive at different times. By analyzing that "traffic delay," the researchers could arrive at a figure for the Hubble Constant. Rusu's contribution was to measure the distribution of mass along the line of sight from quasar to telescope. Other team members measured the time delay for light, and the distribution of mass within the lensing galaxy. "These three things allow us to get a precise measure of the Hubble Constant," Fassnacht said. The Hubble Constant estimate from H0LiCOW, 71.9±2.7 kilometers per second per megaparsec, is accurate to 3.8 percent. The figure is in close agreement with measurements by other astronomers based on observations of supernovae, or of variable stars called Cepheids. But these estimates are rather different from that obtained from the Planck space telescope, which measured radiation from the cosmic microwave background. The Planck measurement does rely on some assumptions, for example that the universe is flat, Fassnacht said. Or, the difference could be a statistical fluctuation that will disappear as the estimates get better—or it could be something more exciting. "If you still see something when the error bars shrink, maybe it's new physics, beyond the Standard Model of cosmology," Fassnacht said. The H0LiCOW team plans to shrink those error bars by carrying out the same measurements for up to 100 lensed quasars, Fassnacht said. 1. "H0LiCOW I. H0 Lenses in COSMOGRAIL's Wellspring: Program Overview", by Suyu et al. 2. "H0LiCOW II. Spectroscopic survey and galaxy-group identification of the strong gravitational lens system HE 0435?1223", by Sluse et al. 3. "H0LiCOW III. Quantifying the effect of mass along the line of sight to the gravitational lens HE 0435?1223 through weighted galaxy counts", by Rusu et al. 4. "H0LiCOW IV. Lens mass model of HE 0435?1223 and blind measurement of its time-delay distance for cosmology", by Wong et al. 5. "H0LiCOW V. New COSMOGRAIL time delays of HE 0435-1223: H0 to 3.8% precision from strong lensing in a flat ΛCDM model", by Bonvin et al. If you go and look at some papers that summarize the Hubble constant estimates you will see that while there has been convergence the individual error estimates are optimistically/laughably on the low side. Perhaps because the estimates of errors are based on the measurement process rather than some of the general assumptions made. A little more modesty and the current estimates would probably still be within the margin of error of each other and still far from where "new physics" is required. "Astronomers measure universe expansion, get hints of 'new physics'"
You need to be banned for posting spam. I was reviewing yet again W Thornhill's lectures and it hit me that this expansion and red shift brouhaha is based on the Cephids original deductions. So, are the Cephids and the LMC measurements actually valid?